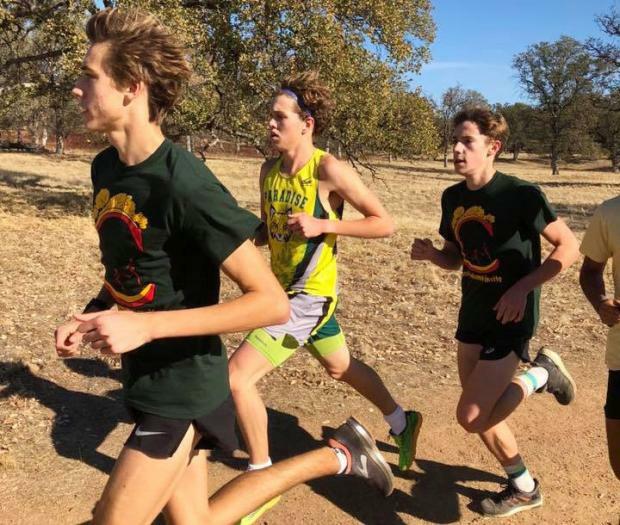 Gabriel Price was not among the handful of runners from Paradise Senior High at the CIF-Northern Section Cross Country Championships, held Thursday, Nov. 8 at West Valley High School in Cottonwood. It is some 76 miles, including about seven miles west off Interstate 5, to West Valley when traveling from Paradise, a Sierra Nevada foothill community northeast of Sacramento. The drive is roughly 90 minutes. That's in normal traffic and normal conditions. The morning of Thursday, Nov. 8 was anything but normal. The small town of Paradise (population just under 27,000) was being destroyed by the Camp Fire, fueled by dry chaparral and warm, gusting winds. Price was a top-ranked runner in Division IV heading into the NS finals looking to qualify for his fourth consecutive CIF-State Championship Meet. But, according to a report in the Chico Enterprise (linked below), shortly before Price was to leave for the cross country meet, he received a call from his father to go to the house to gather some valuables and meet him in Oroville. Gabriel Price would not be running at the NS meet that day. It appeared his cross country season, as well as his goal of earning one last trip to compete among the state's best at Woodward Park on the Saturday after Thanksgiving, was over. Enter a few key individuals: Scott Fairley, the NSCIF Meet Director and Athletic Director at West Valley High School; Liz Kyle, the commissioner of the Northern Section; Annie Stearns, the AD at Paradise, and, among others, the Chico High cross country team and Coach Kevin Girt. On Saturday, I had the opportunity to be part of something truly inspirational as Paradise senior, Gabriel Price attempted to qualify for the State CIF Cross Country Championships in the "Second NSCIF Cross Country Championships" on West Valley's course. As you are well aware, our more serious cross country runners spend countless hours logging many, many miles of running year-round for four years hoping for the chance to qualify for the State Meet. Such was the case for Paradise senior, Gabriel Price who had missed qualifying for state as a junior by just one spot. This year, his dreams seemed to be dashed by the devastating Camp Fire that forced Paradise residents to flee their homes on Thursday morning, just as the Paradise team was preparing to depart for the Section Finals at West Valley. Although a few Paradise runners were able to find their own rides up to West Valley that day, Gabriel Price was not one of them. As news of the Camp Fire reached myself, and Northern Section Commissioner, Liz Kyle, we devised a plan to accommodate any Paradise runners who were not able to make it to the meet. Mrs. Kyle called the State CIF office to ask if they would allow for Paradise runners to run in a "make-up" meet in an attempt to qualify. The state agreed to allow any runner from Paradise who ran a time that would have qualified them from the championship race run on Thursday, to qualify for the state meet without taking the place of a runner who had qualified on Thursday. Paradise athletic director, Annie Stearns, who is a former West Valley student-athlete, contacted me to set up a time when we could run the "second Northern Section Cross Country Championship" race. We set the race for Saturday, Nov. 10 at 10:00am. Annie spread the word to several of her friends in Cottonwood who showed up to support the runner. 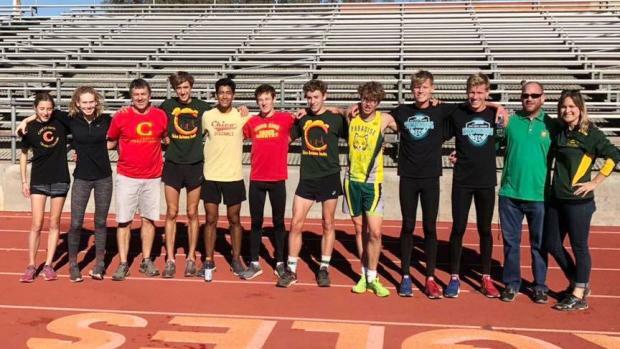 Another former West Valley student-athlete, current Chico High School cross country coach Kevin Girt, contacted runners on his team including section champions Charlie Giannini and Britta Bundy to support Gabe in his effort to qualify for state. Gabriel Price needed to run a time of 17:41 or better in order to qualify based on Thursday's results. A plan was devised to run the first mile in 5:40, then drop off to around 6:20 for the second, hilly mile, and then hang on for a 5:40 last mile. To do this in a championship race with hundreds of runners in the race, and adrenaline pumping through one's veins is one thing. To do it all by one's self, is another. This is where the runners from Chico High helped out. Six of Chico's top runners from their section championship team ran with Gabe and provided support throughout the race. And so, the race was about to begin. 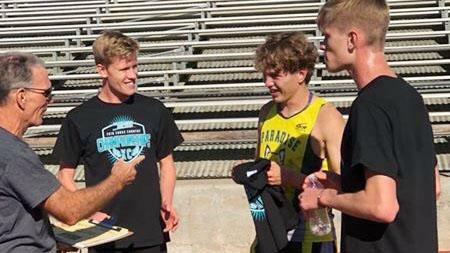 Gabe taught the Chico runners the Paradise team cheer, and with that, USATF starter Dennis Boyle fired the run. Gabe and company came by the first mile looking very comfortable in 5:35. We were looking for anything under 12:00 at the two mile point, and when he came by in 11:35, it looked like he might actually do it...however, by the look on his face, he was hurting. The last mile is tougher mentally than physically, and the Chico High runners kept pumping him up that whole last mile. The thirty or so spectators, including his coach and parents, cheered Gabe on to a time of 17:12, easily qualifying him for state. For an athlete who had just lost everything, to at least have the chance to fulfill a dream of qualifying for the State Cross Country Championships, was truly inspirational. Thank you to all who helped make it happen! It should be noted that there are 44 schools in the Northern Section that compete in cross country. Those schools are divided into three enrollment-based divisions in size coordination with the rest of the state. Paradise competes in Division IV, the second-smallest of the divisions, designated for enrollment between 500 and 1,249. There are 15 schools in NS D-IV. Also note that the NS runs just two championship races: one for boys and one for girls. All divisions run in the same race. The number of allotted qualifiers for the State Meet vary by division. The qualifiers are sorted out for those in the pack -- but in front of the pack in their division -- well after the end of the race. In D-IV, NS qualified two teams, plus up to five individuals if they placed in the top 12 overall in their division but aren't on a qualifying team. University Prep and Sutter were the team qualifiers. Paradise was expected to challenge for one of the two qualifying spots but only one of its runners was able to make the meet. Five individuals not on University Prep or Sutter did finish among the top 12 to earn their tickets to the State Meet. One of those was Patrick Roehling, a junior from Paradise. Roehling placed fifth among D-IV individual qualifiers and 19th overall in 17:41.93 -- the baseline time Price needed to beat to qualify when he ran the course two days later. Price's time, nearly 16 seconds slower than he ran on the same course the year before, would have slotted him fourth in D-IV.